When I first saw the Colt Defender, I wanted one. The early versions wore the upright classic Colt sights, and I was rather dubious regarding the reliability of a three inch aluminum framed 1911. I decided to wait a while and research the pistol. Over the past couple of years, I finally made up my mind. I would have one. The rear sight had been changed to a low profile type sight. The front sight was dovetailed. Those were the good aspects. The pistol also came with fat Hogue "Good Year" wrap around grips and a duckbill grip safety. Those were definite turn offs for me. The clincher though was the reports of fantastic reliability. The bushingless Defender was raved about by it's owners. It quickly sold off the shelves new, and I never saw one used. Those factors told me that Colt had a winner. I almost purchased a Colt Defender in January 2008. Instead, I discovered the Colt New Agent, and I was intrigued by the gutter sighted dedicated carry gun. I decided to buy the New Agent instead. It already had slim wood grips, and it was black. I instantly fell in love with the way the lightweight Colt carried. The positive carry attributes of the New Agent confirmed that a Defender would be my next pistol. I knew where a Colt Defender waited, and on a trip to visit a friend, I stopped on the way to purchase it. The pistol wasn't exactly what I wanted at first, but with the addition of some slim wooden grips, a Nowlin "Speed Demon" hammer, and a grip safety modified to match an early Commander grip safety, it has come damned close. 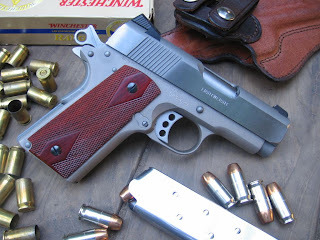 I would still like a dark gun for concealed carry, but the stainless steel and aluminum components of the Colt Defender will certainly survive the hot humid Southern carry environment better than carbon steel. A seven round Wilson Combat Officer's Model magazine fits both the Defender and the New Agent. This magazine increases the capacity to eight rounds, including the one in the chamber. At the range, the pistol is 100% reliable. From the start, I have had no failures using Federal HydraShoks, Speer Gold Dots, and 230 grain hardball. The pistol seemed to shoot a little low, but I am uncertain if that is attributable to myself or the pistol at this time. 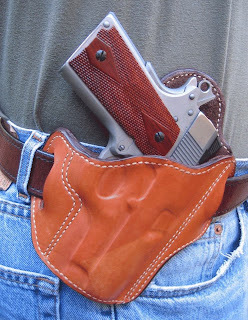 Recoil is greater than that of a Government Model, but the benefit of a light, compact pistol helps insure that the carrier straps it on their belt every day. Update: My Colt Defender now has over a thousand rounds down the pipe, from 230 hardball to JHP. It has been unfailingly reliable. Accuracy has been adequate. This pistol is a carry gun, a defensive weapon, not a precision target gun. With it's short sight radius, if it scores all hits in the black, quickly at 15 yards, I am satisfied. It does, and I am. Either due to cold or vibration, I lost one of the screws holding the cocobolo slim grips on. I installed the remaining screws and the replacement with a bit of gasket sealant to prevent them from backing out while shooting. The attenuated grip safety and Speed Demon hammer work together like a charm. I installed a Cylinder & Slide solid trigger. The little Colt, shown here in a suede lined Ross pancake holster, carries so lightly, it is easy to forget it is on your hip until needed. The entire package makes for a weapon that is virtually invisible underneath a light jacket or sweatshirt. 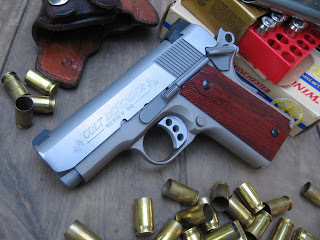 If a person is looking for a lightweight, concealable 1911, I have no reservations on recommending the Colt Defender. Hi Xavier! I know you're a 1911 fan, but I was wondering if you had any experience with or impressions of the CZ 75, or the .45 version the CZ 95? Thanks, and keep up the great bloggings! Why do you prefer dark guns for carry? If given a choice I rather like the matte finish metalic guns. Don't you want your drawn gun to be MORE visable? "A seven round Wilson Combat Officer's Model magazine fits both the Defender and the New Agent. This magazine increases the capacity to eight rounds, including the one in the chamber." My Factory Colt mags in my New Agent are 7 round mags. I'm curious if they made changes or if you and I were given different magazines. WB, I just feel like they hide better in the recesses under a jacket. My Kimber (series I) Ultra is your Defenders close cousin. 230 Grain Short Barrel Gold Dots are the carry round for these 3" beasies. Great pistola Xavier, I always liked the Defender once it was "fixed"-good sights, real trigger,not the factory plastic POS and a real beavertail grip safety! I ended up with the Springfield Micro Compact .45 and Wilson mags-get this, it's great for off duty everyday carry,as my backup for normal duty, and when I know the $#!#'s gonna hit the fan it becomes my ankle gun,backing up a Series 70 Colt Govt and a LW Commander-magazine interchangeability,right? The Wilson mags & Speer Gold Dot ensure they all go bang when they need to, and operation for all is the same-better than when I was carrying a 1911 for primary and a PPK for backup! Xavier, I understand this entry is becoming old news, but I put a lot of stock in your review of the Colt New Agent before I purchased one. I have found it a terrific little pistol, but I wondered how you would compare the NA to the Defender since you seem to own both. Which gets more use or milage time, and why? Thanks. I enjoy your blog a lot. The Defender. Stainless for wear factor, sights for more accurate shooting. Hi, I just bought a new defender. I too am not a fan of the grip safety. Can I ask where you got yours? Was it drop in or did you need smithing?? Thank you! !